Your holidays at the camping Yelloh! Saint-Emilion will be unlike anything you have ever experienced. From the heart of this renowned vine growing region you will be able to discover a myriad of different sites that make this region so beautiful. You will be intoxicated by the beauty of the town of Saint-Emilion with its heritage sites and its good wines and the town of Libourne will be an outing you will want to go on with all the family. You can also visit Bordeaux, one of the most beautiful cities in Europe, or why not discover the unique cultural and historical sites of Castillon-la-Bataille. Stop for a while in Arcachon and enjoy the gentle lifestyle of this little fishing port. Discover the programme for your next holiday right now! Visiting Saint Emilion means jumping back in time. A time which provides the pleasure of a combination of architecture, way of life and the Middle Ages. Saint Emilion, with its lovely mediaeval town centre, has managed to retain some vestiges of this period virtually intact. Spend a bit of time exploring the town on foot, by bike, on the tourist bus or on the little train, with guided tours held regularly! Everything's in place for the kids, and there are special tours which feature a big treasure hunt through the town, specially for them! 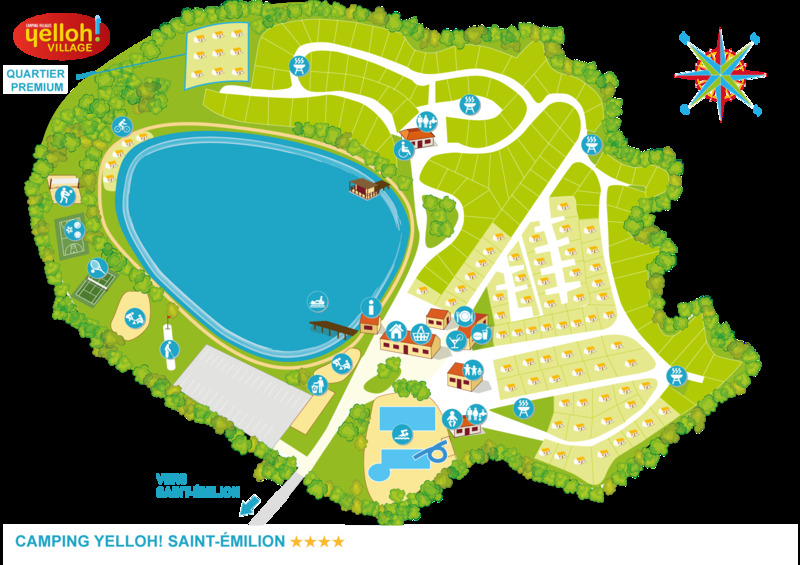 At campsite reception you'll find practical information about Saint Emilion and also be able to register for the free shuttle service. Saint Emilion is a prestigious name, which evokes wines that are famous all over the world. Make the most of your stay by coming to discover the vineyards and finding out about winemaking methods, meet the winemakers who are so passionate about their region and try some of the delicious wines produced here! Campsite reception will tell you where to find the best cooperative wine sellers, wine producers and vineyards. You'll also be able to register to meet these winemakers who love their region so much! Located just 10 minutes away from the campsite, the city of Libourne will be ideal for discovering the region or enjoying a shopping outing. With a shopping centre, cinema, exhibitions, festivals and more, you'll find all you need here! Your visit to Libourne will be an opportunity to enjoy a bit of relaxation on the beach or beside the lake, or how about seeing the amazing tidal bore called the mascaret, when the ocean tides hurtle upriver. Don't miss the open-air market, every Sunday morning. Only 40 minutes from Yelloh! Village Saint Emilion, Bordeaux was recently voted France's most beautiful town and is certainly worth a trip. Enjoy a stroll down the quaysides, past the walls of the fine buildings, then branch off to the more highly-populated area of Saint-Michel, which is where you'll find the very soul of Bordeaux, before enjoying a bit of time in one of the city's parks. The "water mirror", visually spectacular and adored by children, adds the perfect finishing touch to the Place de la Bourse, just a step away from the emblematic Grand Théatre whose cultural light has shone over the historic town centre for more than three centuries! A true celebration of wine, the Cité du Vin is a unique landmark with its futurist architecture and swirling curves. Make the most of your stay at Yelloh! Village Saint Emilion and take the family on an exploration of the world’s vineyards, presented through the permanent exhibition and various wine-tasting sessions. And the kids haven't been forgotten with fun educational workshops designed especially for them! The Cité du Vin also houses fascinating temporary exhibitions, but the "high point" of any visit must be the belvedere! At a height of 35 m it offers an incredible bird's eye view over the city! This is one experience you really shouldn't miss during your holiday at Yelloh! Village Saint Emilion in the Gironde! 5 km from the campsite, the Citadelle de Blaye, a former military complex designed by Vauban and an official UNESCO World Heritage Site, is a historical monument that offers a unique panoramic view over the Gironde estuary. Take the little tourist train or a horse-drawn carriage to visit the citadel and enjoy a great family outing! So many fabulous places to discover during your holiday at Yelloh! Village Saint Emilion.